A few thousand sleeping giants have awakened; where we were once snuggled into eight-hundred thread count sheets and fluffy duvets, drinking our ginger-kale smoothies on the way to yoga or an awesome surf sesh, we are WIDE AWAKE. I have never been more proud to live here. All the Davids took on Goliath and we WON. In my not-so-little-anymore coastal town of Carlsbad, a mega-developer (Rick Caruso is the billionaire Republican developer and the dad of the “hot”– but not really hot — debate guy). who owns a mega-yacht tried to work his way around the normal processes for development (with the blessing of our mayor and city council) to build a mega-mall on Agua Hedionda Lagoon. Agua Hedionda is a sensitive ecosystem that feeds into the Pacific Ocean. 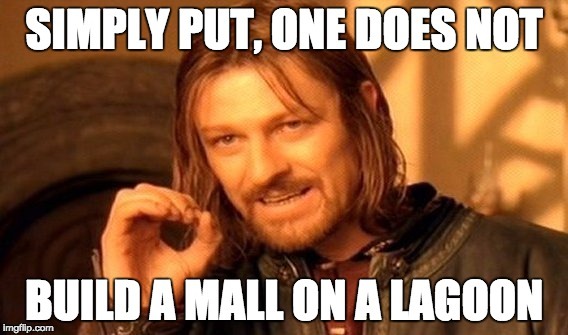 Simply put, one does not build a mega-mall on a lagoon. No matter how much I love to shop at Nordstrom, NO WAY. A movement was born to fight the onslaught of questionable tactics with subverted and suppressed democratic processes — the very opposite of transparency — while dozens of citizen volunteers stepped up to spread out throughout the city from dawn to dusk to acquire signatures for a referendum to overturn the Caruso initiative and put the mall development to a vote OF THE PEOPLE, BY THE PEOPLE, FOR THE PEOPLE. On Thursday, we met in the library parking lot and marched as a group to Carlsbad City Hall to deliver boxes and boxes of signed petitions. We were stalked the whole way by Caruso goons and his campaign lawyer — that guy lurking behind the fence in the black suit and mirrored sunglasses. Strong arm tactics and million dollar TV and print ad campaigns didn’t deter our citizen warriors. You say you want a revolution? Well, you just got one.